As a final year OT student, my mind is never far away from the fast approaching task of job searching. Attending today's BAOTNW study day was another chance for me to encounter occupational therapists using their OT skills in a variety of settings. Leanne Moran and Mary Driver shared with the group about their role working with the top 3% of vulnerable adults within their locality within a Care Coordinator role. The service appears to be doing some great work at reducing hospital admissions and pressure on GPs locally by managing these clients within their MDT teams remit. They also shared the differences in their role that wouldn't be seen as 'traditional' such as taking bloods and Obs. I was really interested in their role in speeding up discharge for the individuals they work with when they do end up in hospital and how they additional skills enabled them to increase the productivity of the team and in turn increase the efficiency of client care. Take home: This role enabled holistic outlook and by empowering client it had a positive effect on their self management of their conditions. Gail Russell shared her experience of posture management and how posture has a major impact on function. She highlighted the importance of assessment in aiding healthy posture of our clients, and figuring out what we can correct and what we need to accommodate for within our seating and posture provision. 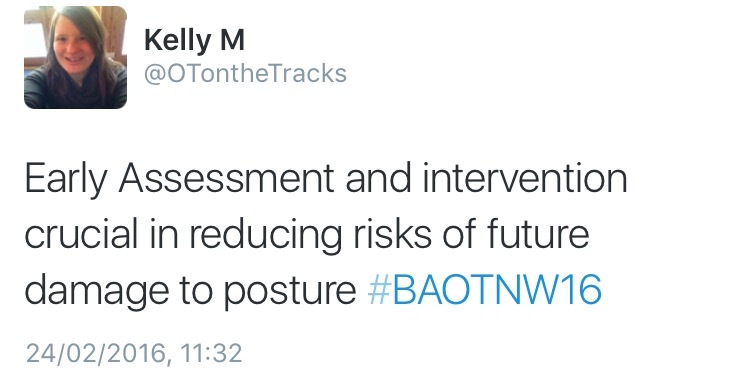 She also highlighted the importance of early assessment and intervention in individuals with posture issues, if we are to prevent further negative impact on occupational engagement due to their postural issues impacting on range of movement and their ability to partake in what they want and need to do. I have had great learning experiences on both my paediatric placement and my placement with adult social services with regard to assessing both children and adults within posture management and listening to the presentation today, I realised how much I actually have learned about the impact on both individuals occupational performance and their own spinal structure. Also on the note of placements, it was great to bump into one of my educators from my PP1 and catch up on whats she's up to now. It's hard to believe how fast the last year has gone. Take home: No matter the setting I work in as an OT, I need to be proactive in making sure the early intervention of assessment is spotted and either referred on for or dealt with so that the client is able to have the best possible out come long term. Is case management the next step in your occupational therapy career? Carol Collins, shared on the varied role of occupational therapists working as case managers within acquired brain injury. Firstly she shared an overview of the history of the role and where OTs could fit into the area. 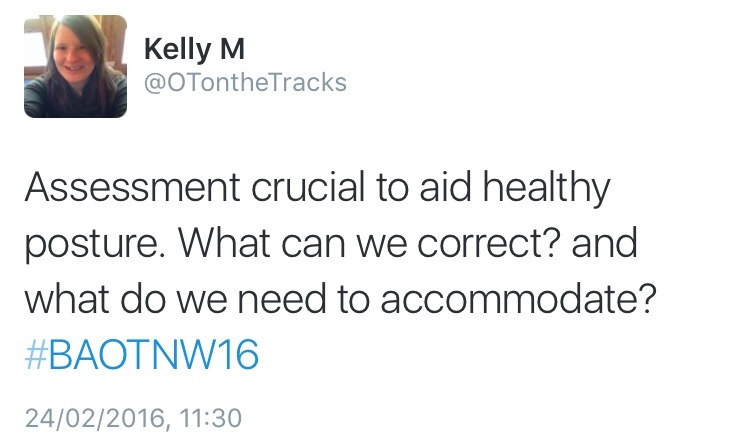 She also highlighted how our mixed training within physical and mental health make us ideal for this role. Occupational therapist make up the biggest group of professionals within the role in the region (Social workers, nurses, physics and speech and language therapists being the other professionals working within the role). Carol also highlighted the skills we would need to work in the role - knowing your own limits, expertise, use of supervision appropriately, self preservation, back up in our role from other professionals, availability as the role can be time consuming and range in the working hours and to be realistic about what we can do. It was also really interesting to hear about the progression from novice to advances practitioners within the British Association of Brian Injury Case Managers. Carol highlighted that the role needed the professional to think of initiative ways to create independence which is very OT!! Take home: As OTs we inherently think outside the box when we are working with individuals, working in a role that isn't 'traditional NHS health' can allow us to flourish in this. Our duty of care is always to the client! June Wilcock and Rachel Jones shared with the group about their role within Inspiring Minds Salford. The service uses creative group activities such as photography, creative writing, art and woodwork to build self esteem and confidence over a 6 to 18 month period an referred individual is with them. It was interesting to hear how they use standardised assessments such as PHQ9, GAD7 and WEMWS which their initial assessment and how OT influenced the rest of the initial assessment. Rachel shared about the use of the five ways to well being (give, keep learning, connect, be active and take notice - which I'm looking forward to reading more about when I get a moment. She also shared about her role in community integration for individuals that have gone through the service helping them on a 1 to 1 basis access opportunities, volunteering and education when leaving their service. This is also supported by the reviews post discharge which I thought was a really positive use for n OTs skills in helping individuals do was is meaningful to them. Rachel also shared about a group that works with individuals about to leave the service to increase peer support post service and also helps educate the individuals about the choices of occupations they chose and how this impacts on their well being. Take home: This service really interested me and I want to find out more! I also loved the importance of educating individuals on the impact our choices of occupations can have on our well being. Lynne Goodacre's presentation focused on the storytelling of our research. Emphasising on how we can communicate our services impact to others. We need to take responsibility to seek out what is going on in our area/organisation research wise. We need to give our clients the opportunity to get involved in studies. It doesn't mean we are recruiting them, It is informing them of what is happening and giving them the chance to get involved if they want. Lynne also highlighted the research culture we want to create and work in as practitioners who are use evidence based practice with our clients. It is a long process to transfer research into practice, so we need to take courage and make the movement as best we can in this environment by seeking out the opportunities. Take home: Understand the environment we work in, Promote Research and Use the Evidence base. Sarah Harris shared her experiences on working with the BBC on the program and the differences it had to a typical housing adaption. The cost being a major thing. Normally in housing adaptions there is a need to apply for a disabled facilities grant, to get funding to undertake adaptions to a property for example ramping or stairlifts, but in this process funding was fundraised to support the big build and equipment donated by providers to enable the build to be completed. Sarah shared the ins and outs of the process from start to finish with where her OT Ax took place and the challenges of being an OT on this project. I was struck whilst she spoke of the impact OTs have on fighting for the independence of of our clients, even when the matter seems so small to others involved. We advocate for independence! Take home: Advocate for independence because we know the importance for individuals, that being able to undertake their daily occupations on their own can have on their health and well being. All in all, a really great day with loads to think and reflect on as a student OT starting out in practice pretty soon. It also gave me a chance to meet some fab OTs and catch up with 2/6 of the #OTalk team. Massive thanks must go to the speakers and the BAOTNW committee for putting on such a brilliant networking/CPD study day. Collins C. (2016) Is case management the next step in your occupational therapy career? 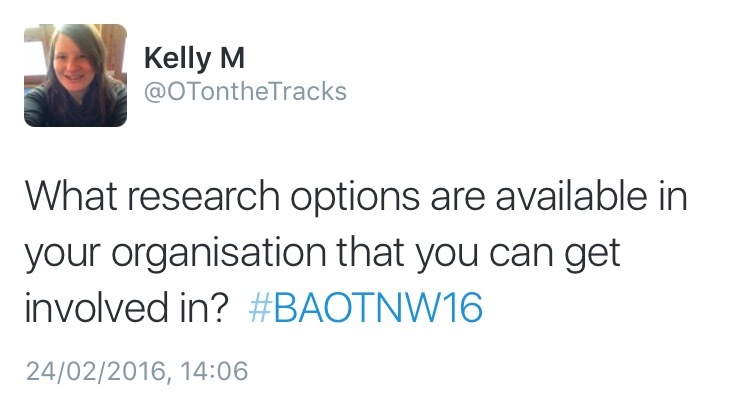 [Presentation at BAOTNW Study Da ], University of Cumbria. 24 February. Goodacre L. (2016) The EPIC Model for Emergent Health Research [Presentation at BAOTNW Study Day], University of Cumbria. 24 February. Harris S. (2016) Occupational therapy & the biggest ever DIY SOS project: Walking with the wounded [Presentation at BAOTNW Study Day], University of Cumbria. 24 February. Helen_OTUK (2016) 24 February. 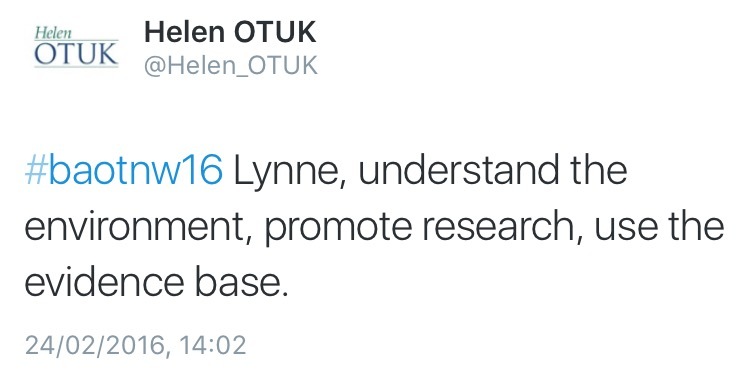 available at: https://twitter.com/Helen_OTUK (Accessed 24 February 2016). Moran L, Driver M. (2016) The Evolving role of the occupational therapist in extensive care [Presentation at BAOTNW Study Day], University of Cumbria. 24 February. Russell G. (2016) Putting the OT in pOsTure [Presentation at BAOTNW Study Day], University of Cumbria. 24 February. 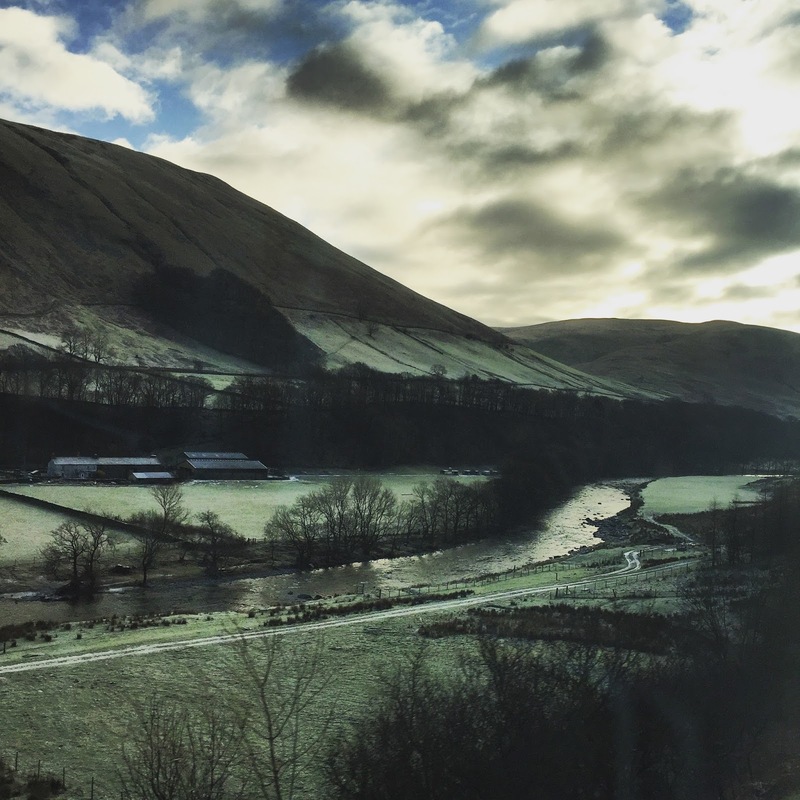 Wilcock J, Jones R. (2016) Creative occupations and mental well being [Presentation at BAOTNW Study Day], University of Cumbria. 24 February.